Increasingly dire scientific warnings about climate change are propelling international and U.S. panels to recommend heightened, immediate action to reduce manmade causes of greenhouse gas emissions. But the possibility of a unified global approach to climate change appears less likely as leaders continue to debate potential solutions, the reliability of warnings and regional fiscal and social responsibility. The Obama administration is making headway, however, on its climate change agenda despite industry and Republican opposition. Recent court rulings bolster President Obama’s efforts, although he still must deal with the possibility of a Republican majority in both houses of Congress next January and sway public opinion regarding the nation’s energy and environmental priorities. Progress on that front, and on a potential bilateral agreement with China on reducing greenhouse gas emissions and hazardous pollutants, could help lay groundwork for international treaty negotiations scheduled for 2015. Industrialized nations have been negotiating since the 1990s on a pledge to reduce GHG emissions. Yet little progress on the agreement has been made since targets were set under the 1997 Kyoto Protocol, an addendum to the 1992 United Nations Framework Convention on Climate Change. 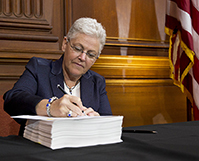 Nearly 200 countries — not including the United States — ratified the protocol, which set binding limits on GHG emissions.